While walking through the Egyptian wing of the Louvre in Paris, I had a novice recurring belief that the exhibit was over: Surely the sarcophagus I was seeing would be the last one, the best one, in the museum. Shortly after leaving the room of the Suspected Last Sarcophagus, a room of Twenty Five Even More Monumental Tombs would materialize, each hand-painted coffin weaving an epic tale of its former occupant. If the ancient Egyptians believed they were speaking to the gods by painting letters on the inside of their tombs, they may have only succeeded in speaking to very confused people who live in the future. People like me. Yet, at some level, this is all that any of us are ever doing. Though we live in a time that values the moment-as-king, people 4000 years into the future will undoubtedly look back on our art, monuments, and tombs, and say: I know you, yet I have no idea. Even when I write "Ancient Egyptians" I realize I am lumping a huge amount of people from a span of time into two little vague, sadly unspecific words. Saying 'Ancient Egypt' is as unfair as assessing characters in Seinfeld and Shakespeare into the same category - a difference of 400 years is chump change as far as ancient history goes. Above: This piece of stone, installed in a neck-ache of a ceiling, displays the path of the sun and stars through constellations that we still know today. While deities like Ra and Set have gone by the wayside of our popular imagination, we still know our Sign and check our horoscope in the newspaper. Looking closely, you can see constellations like Taurus, Sagittarius, Cancer, Scorpio, and many more. Maybe with enough imagination and empathy, Ra and Set will have their day again. Like the rings of a tree, the wrapping on the face of this mummy each seem to say "here is another year lived, here is the dimensionality of my self." Looking at the wrapping, it's hard to tell if the weaving goes in reverse, from the outside in, or from the inside out. No other part of the mummy was wrapped in such a way, as the head proves to be it's own project, separate from the rest of the body. 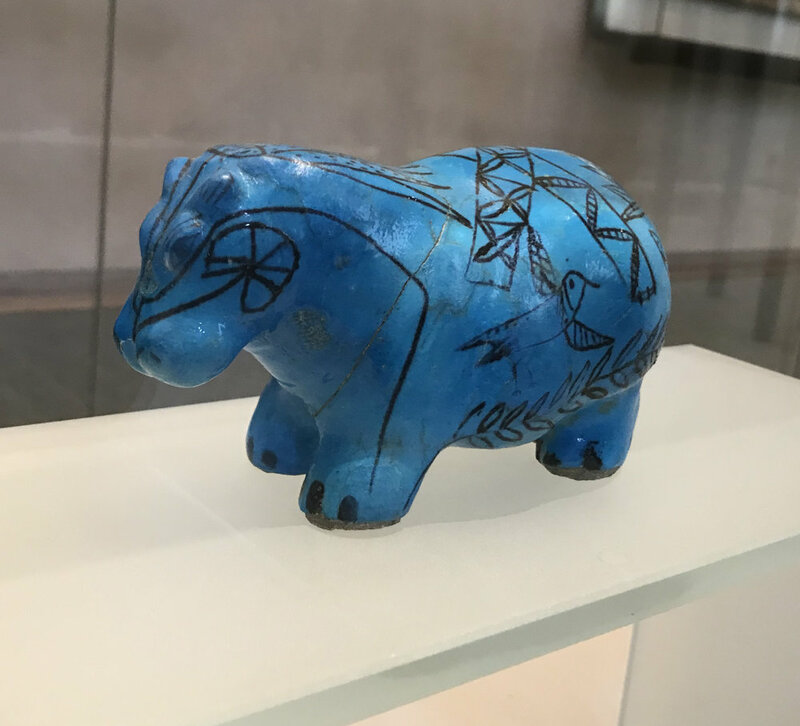 Hippos figure as a popular motif in Egyptian friezes. Both a regonizable and terrifying creature, they inhabit friezes that depict the Nile. Aside from the tombs, sarcophagi, and mummies, the Egyptian wing holds miniature treasures untold. Ra, Horus, Bastet, all manifest in brilliant portable form. At one point, the descriptive tags of these talisman, packed along the display case, grow overwhelming. You could spend an entire day reading them all. How many years of scholarship can be poured into a one-inch figurine? The blue hippo is not just a hippo, it is a world in itself, containing birds, reeds, patterns, and lilies. Like a warrior with marks of success, this figurine stands the test of time. What was it? A decoration? A biological marker? Or perhaps it is a vivid reminder of the Nile's capacity to hold surprises.